The non-profit-making organisation was created in 1982 within the Institut Supérieur d'Architecture de Saint-Luc in Brussels. From its very beginnings and, as its name suggests (CERAA stands for Centre d’Etudes, d’Actions et de Recherche en Architecture), our organisation has aimed to carry out studies, research and actions at the forefront of architecture. Its role complemented the Institute’s teaching one and extended the action of the latter by establishing a link between theory and practice as part of a multidisciplinary vision. Since the 2000s, we’ve been offering, in addition to the work carried out within the organisation, study days on sustainable construction aiming to inform, motivate and bring together the stakeholders from the sector of architecture. When the Higher Institutes of Architecture were integrated into the Universities in 2011, we chose to retain our independence while carrying on with the missions we had assigned ourselves. The start of the 21st century brought to light new environmental, social and economic challenges. Our society must adapt in order to, among other things, cope with climate change, resource depletion and embrace sustainable development. The built environment, from architecture to land, plays a major role in this “eco-transition”. As soon as these new challenges became apparent, we decided to focus our work on the study and research into alternative, tenable and fair solutions. The objectives of this approach include foreseeing future changes, creating resilience, allowing due time to assess the effectiveness and impact on the quality of life of the solutions devised before implementing them on a large scale. The CERAA is now at the forefront of this field and we are focussing our activities on awareness-raising, the training of professionals, as well as research and consultancy around these issues. Who is the CERAA for? Today, we’re offering our services to any public or private individual, mainly professionals from the construction sector such as architects, contracting authorities, whether public (municipalities, housing management services, regions, communities, etc.) or private (property developers, etc. ), engineers, trade associations, architects’ practices or groups, as well as future professionals or the organisations which supervise them (vocational training schools, universities, etc. ), public or private institutions with an interest in sustainable development, the media, etc. For us, it’s a matter of concretely supporting and assisting all these various players in the implementation of sustainable development into their daily practice of design or transformation of buildings while taking into account the built, natural and human contexts. In order to achieve this, we have developed a range of services which can be combined with the search and diffusion of sustainable architectural and technical solutions. Our main services involve consultancy (guidance, carrying out studies), organising training courses, study days, site visits, or any other information and awareness-raising event aimed at professionals, developing tools to help implement sustainability standards into professional practice, and the assessment or certification of buildings. If you would like more detailed information, please go to our “Services” page. On our “Achievements” page you will find an overview of the various projects we’ve carried out or which are still ongoing. Our team is composed of dynamic and motivated people with a wide range of experience. Our employees are mainly architects with experience in Brussels urbanism or architecture, and some are also EPB Advisers or accredited BREEAM Assessors. In addition, we also rely on the knowledge of Eco-Advisers and Art Historians. The diversity of these complementary profiles, as well as that of our network of specialists, enables us to offer our clients a wide range of theoretical and practical skills. You can find out more about them on our “Team” page. Why become a member of the CERAA and how? The work of our team is supported by the General Assembly (G.A.) and the Board of Directors (B.o.D). The G.A. includes all our full and affiliated members and is composed of professionals from the construction sector and/or who show an interest in our activities. The G.A. not only decides on the positions taken by the organisation, but also lends its expertise to the team. By becoming an affiliated member, you will be able to attend, once or twice a year, the G.A. meetings. You will then be given the annual presentation of our activities and will be able to take part in in-depth discussions pertaining to our practice and the matters it involves. Becoming a member is also a way of supporting our journey. We ask people who wish to become a full member to pay a €15 subscription (payments to be made to the BE31 0011 4057 0355 account, reference: name, surname, address and contact details). We will then contact you to complete your record. For more information, please contact us by phone on 02/537.47.51 or by email on info@ceraa.be. 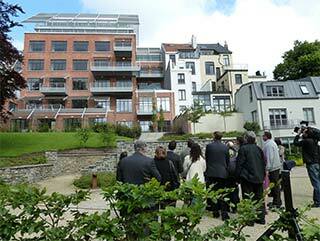 The CERAA is a founding member of AQUABRU – the Brussels water partnership – and the Passive House Platform. We are also a member of the Ecobuild Cluster (Brussels Capital-Region) developed by BrusselsGreenTech and of the Eco-Construction Cluster (Walloon Region).